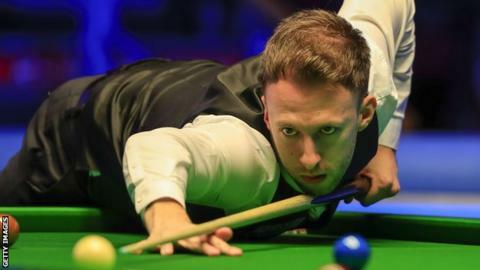 Judd Trump fought back from 8-5 down to beat World Champion Mark Williams 9-8 and set up a Tour Championship semi-final with Ronnie O'Sullivan. The world number six found breaks of 68, 61 and 59 during three frames to draw level and after both players missed chances, took the decider. "I'm over the moon to win that one," said Trump, 29, in Llandudno. World number one Mark Selby gave up a 6-2 lead to lose 9-8 to Neil Robertson, who plays Mark Allen in the semi-final. "I just thought if I got beat it would be alright and I could go home and get ready for the China Open," said Robertson, 37. "However, I have always got that belief in me." Selby's exit means O'Sullivan will become world number one if he wins the tournament. 'The Rocket', 43, overcame Bingham 9-3, while Allen booked his last-four place by seeing off Kyren Wilson 9-7, having led 7-2 at one stage. O'Sullivan's semi-final with Trump begins on Thursday, while Allen meets Robertson on Friday, in the best of 19-frame semi-final.